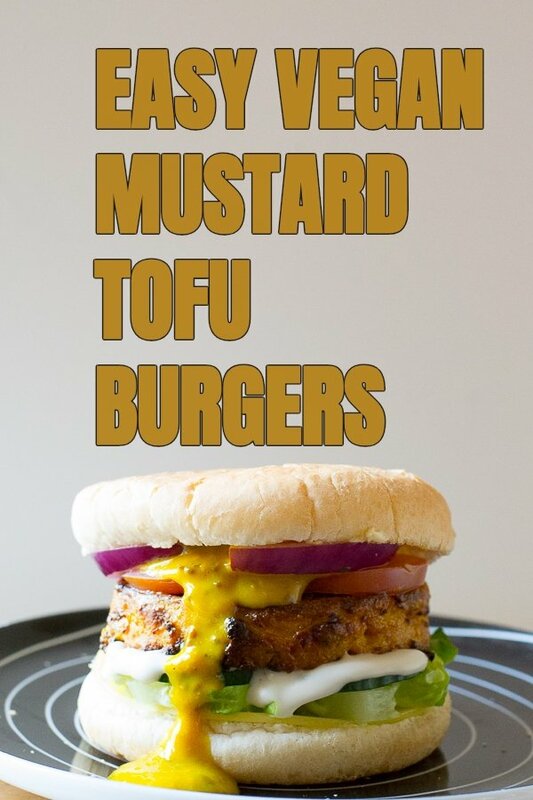 This tofu burger isn’t like the others. It’s not one of those yes-it-has-tofu-in-it-but-it-also-contains-about-twenty-six-other-ingredients-and-will-take-about-sixteen-hours-to-make-and-use-a-load-of-pans-you’ll-need-to-wash-up-after. 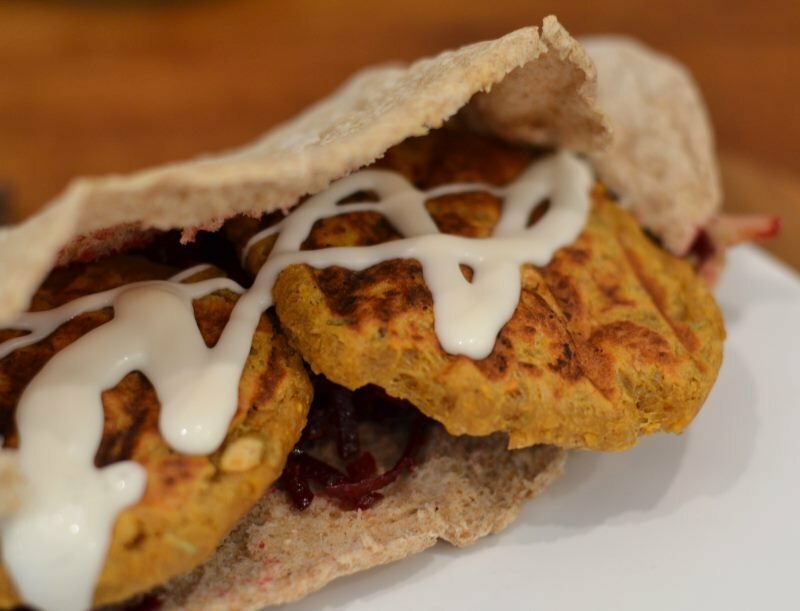 This easy vegan tofu burger contains one ingredient and I’m not going to insult your intelligence by making you guess what it is because it’s obvious to even the most stupid person. Portobello mushroom burgers are the best veggie burgers you can get. 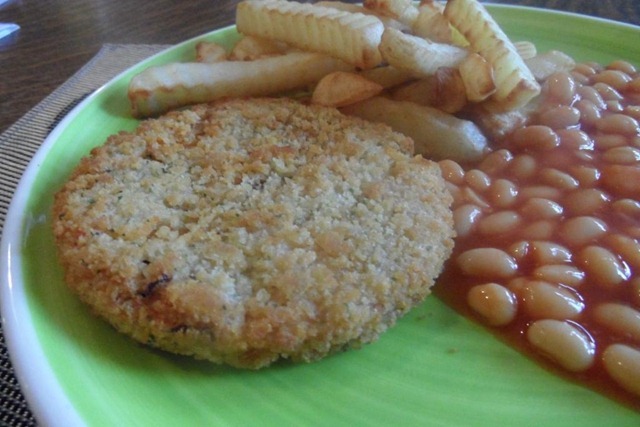 I’m all for the more ‘meaty’ veggie burgers, like the Linda McCartney ones but when you’re out and about, the veggie burgers on offer are usually more of the indistinguishable mushed-up vegetables coated in breadcrumbs variety. 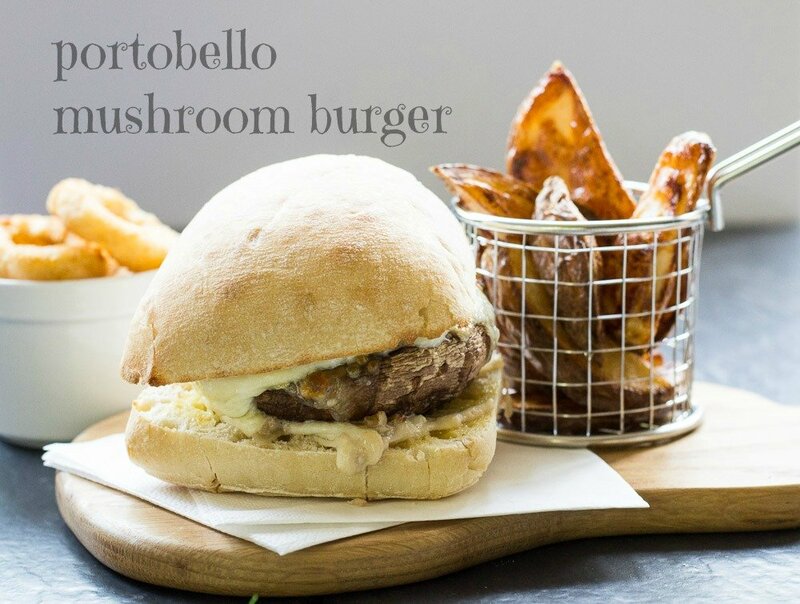 So, when I see mushroom burgers on the menu, that’s what I always go for, especially when they’re topped with halloumi which is how The Foundry pub in Canterbury serves them. The mushroom burgers in that pub are so good, even my meat-eating friend gets one when we go there instead of one of the many meat dishes they sell. My resolve weakened at the weekend. 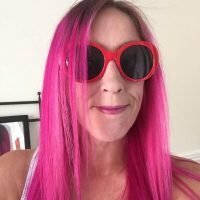 Don’t panic, not my Veganuary pledge – not eating cheese is a breeze. No, it was my ‘I’m not going to drink alcohol in January until the 30th when I go on a pub crawl’ resolve. But I fancied a drink on Saturday, so I had one. One bottle of wine, that is. Well, make that a bottle and a half. I should also probably confess that, according to Barnivore, it wasn’t even vegan wine (Hardys, if you’re interested) but as I don’t take too much notice of whether wine is vegetarian or not at the best of times (and certainly not if I’m drinking it in a pub), I’m not going to feel too guilty about that and, in my defence, it was a bottle I’d bought before Veganuary, anyway (although that doesn’t defend it’s non-vegetarianness). Saturday’s breakfast had been a superfood smoothie containing spinach, apple, clementine, raspberry, wheat grass powder, acai powder and chia seeds. I said in Friday’s post that wheat grass is great for an energy boost and it certainly powered me through Saturday morning’s spin class. 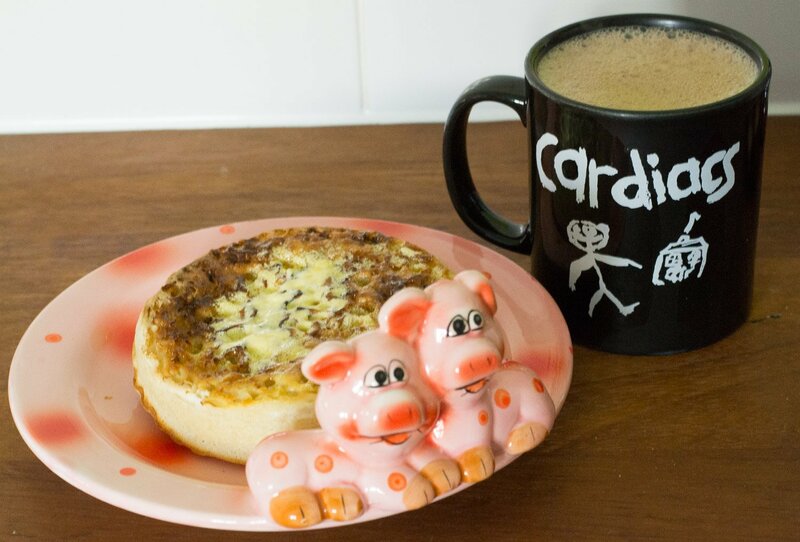 After burning all those calories at the gym, I ate them back at lunchtime in the form of a Warburtons Giant Crumpet with Vitalite, and a mug of hot chocolate. and although I’ve enjoyed them all, making burgers can be a bit of a time-consuming faff, as well as creating a lot of washing up. 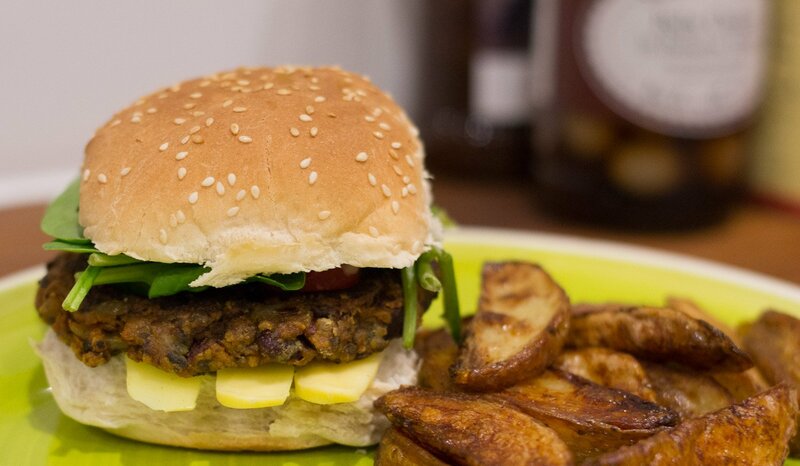 These vegan smoky mushroom burgers from Vegan – 100 Everyday Recipes, while not whipped up in an instant, aren’t too much of a chore and the results are worth it. I made the whole amount, cooked enough for two burgers, then froze the rest of the mixture to use another time. The way I made these burgers is pretty much as it is in the book but I added garlic as cooking onion without garlic seemed wrong. I also left out the 30g coriander the original recipe has as I’m not keen on coriander. Place the kidney beans in a bowl and mash thoroughly with a potato masher. Heat 2 tbsp of the oil in a frying pan and fry the onion and garlic for a couple of minutes. Add the mushroom, carrot and paprika and fry for a further 4 minutes. Add the vegetables to the beans with the oats, soy sauce and tomato puree. Season with salt and pepper and mix well. Divide into 6 portions and shape into burgers, then lightly coat in the flour. 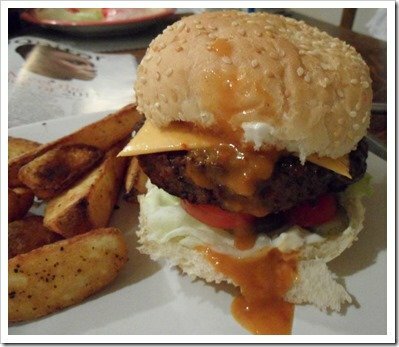 Heat the remaining oil in the frying pan and cook the burgers for a few minutes each side, until lightly browned. I didn’t have any breakfast on Sunday and for lunch I had some of the cake my friend had sent me (which you can see on last Thursday’s post) and a mug of hot chocolate. Not the most healthiest of lunches but hey ho. Dinner was a jacket potato with chilli, Violife and sour cream. Again. That’s the third time this month I’ve had it so I’ll spare you looking at the photo of it for the third time. As I write this (on the 18th), there’s two weeks left of Veganuary. I still don’t feel any different. Maybe I should get a tattoo or a t-shirt or something (just kidding). 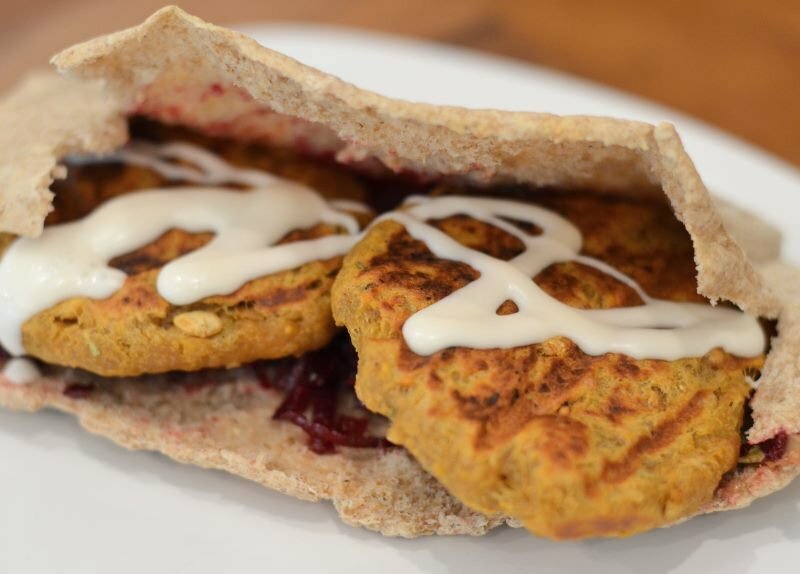 Ever since I picked up a copy of Veganomicon by Isa Chandra Moskowitz and Googled to see what other people made from it, these chickpea cutlets came up time and time again. 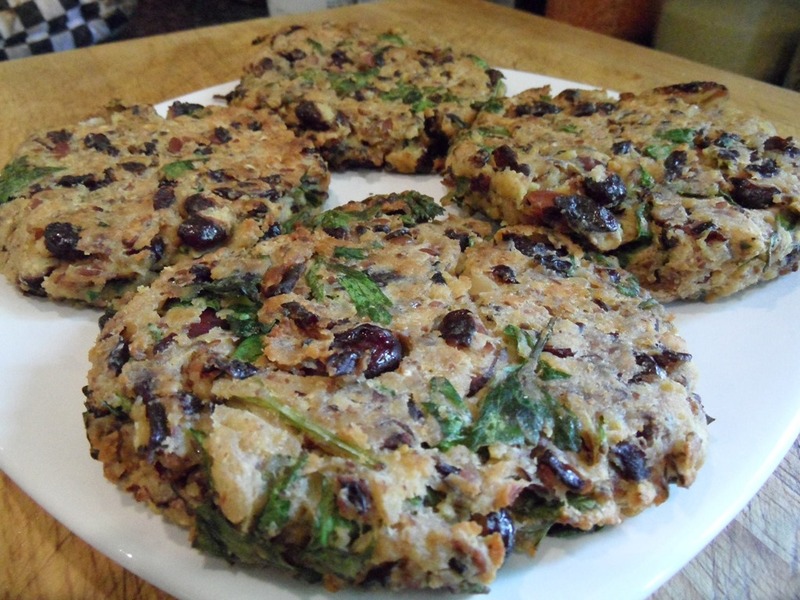 I’m not sure why I haven’t made them before now – the only reason I can think of is because they contain vital wheat gluten and, when I first got the book, I didn’t have a clue where to get vital wheat gluten from; I thought it was some strange substance only to be found in America. UK suppliers soon caught up though and now, although I’ve never seen any in any shops, vital wheat gluten (sometimes just called wheat gluten) is easy enough and cheap enough to buy online from a number of places, such as Buy Whole Foods Online, which is where I bought mine (it may well be cheaper elsewhere – I’m still using the bag I bought ages ago and it was the cheapest I could find at the time). 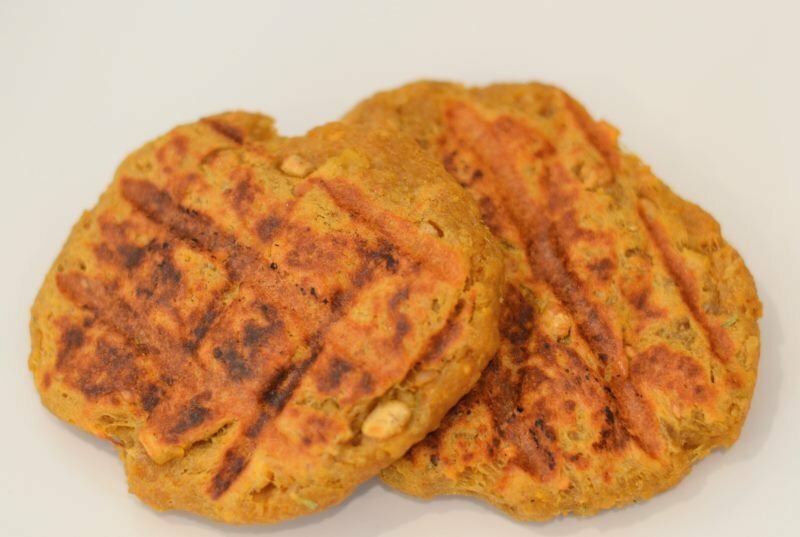 The other day, I fancied making some seitan and had a look in Veganomicon for a recipe and saw the famous recipe for chickpea cutlets and decided to give them a go. At the risk of sounding like a letter on Points of View (ask your parents, kids), why oh why oh why did I leave it so long to make them? They’re a lot simpler than seitan and ready to eat in about 30 minutes. 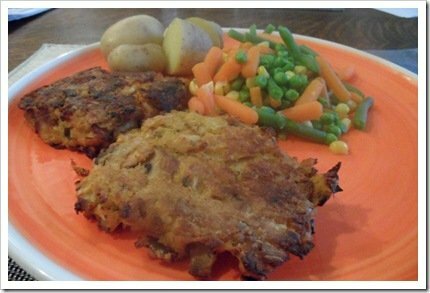 If you want Isa’s original recipe, it’s here on the PPK website but, as usual, I omitted ingredients I didn’t have; using other ingredients instead and, instead of baking or frying, I put the chickpea cutlets in my George Foreman, which worked wonderfully. I suggest making a double batch and freezing the leftover uncooked cutlets to have another day. As you can see from the photos, I’ve had the cutlets in pitta bread with salad and vegan mayo but I can confirm they go just as well with potatoes and green veg. In a mixing bowl, mash the chickpeas with the oil with a potato masher or fork until no whole chickpeas are left. Add the rest of the ingredients and knead for a few minutes until strings of gluten have formed. 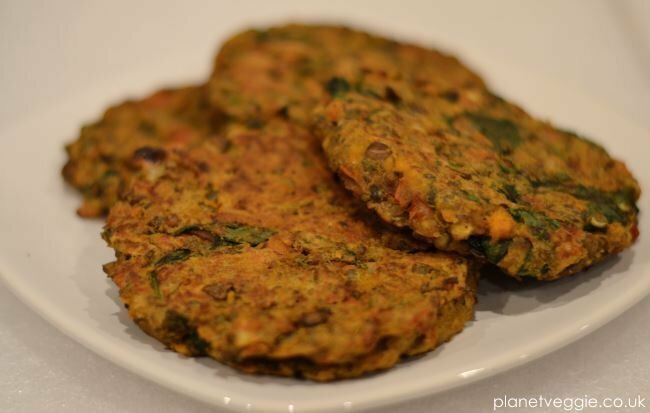 Divide the dough into 8 pieces and form into patties. Fry in a little olive oil for 6 to 7 minutes each side, bake in the oven at 180C for 30 minutes, or grill in a George Foreman for about 10 minutes. What’s better than burgers? Yes, healthy burgers! There’s quite a lot of messing about with these burgers but the results are worth it. They’re also great cold for lunch or as a snack the next day. Pre-heat the oven to 190C/375F/gas 5. Boil the lentils in 750ml water. Cover, reduce the heat and simmer for 30 minutes, until tender. Drain and transfer lentils to a large mixing bowl and mash with a potato masher. Meanwhile, place the spinach in a saucepan and sprinkle over a little water and heat until wilted. Steam the sweet potato for 8 to 10 minutes until tender. Add the potato to the lentils and mash thoroughly. In a frying pan, heat 2 tbsp of the oil. Add the onion, garam masala, curry powder and cayenne and cook until the onion is translucent. Add the spinach and garlic. Cook for about 2 minutes, tossing to combine. Mix the spinach-onion mixture into the lentil mixture. Stir in the eggs, coriander and salt. Fold in the breadcrumbs and flour. Adjust seasonings. Shape into 8 burgers. In an ovenproof frying pan, heat the remaining 2 tbsp oil. When hot, add the burgers and cook until browned on each side, 6 to 10 minutes total. Transfer the pan to the oven and bake for 12 to 15 minutes, until the burgers are firm and cooked through. Buy Veggie Burgers Every Which Way by Lukas Volger at Amazon. After seeing someone posting this on one of the vegan Facebook groups I’m a member of, I really wanted to make them. There’s quite a lot to it – it’s not something you’re going to whip up in a couple of minutes – but it’s mostly seasonings and the method isn’t difficult at all. 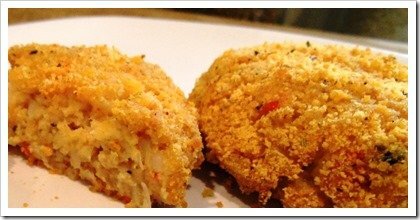 I halved the recipe for the crab’less cakes, cooked two of them, and froze the rest. The nori sheets give it the ‘fishy’ taste and they make a great alternative to the usual ‘meaty’ stuff. 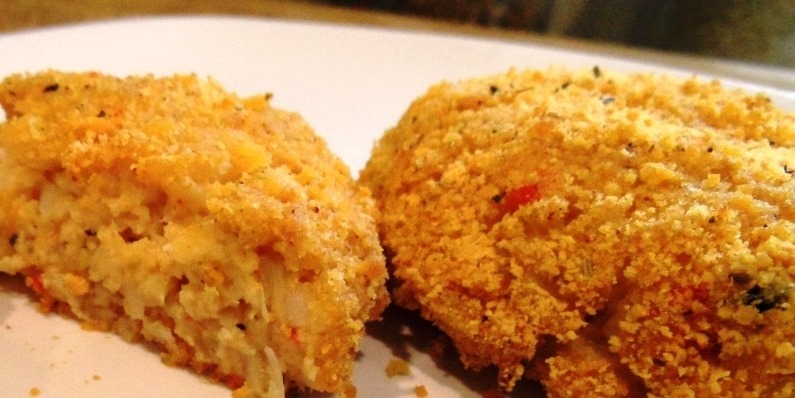 You can find the recipe for the Gentle Chef Maryland Crab’less Cakes on his website. I can never be bothered to cook when I get back from my evening spin class, so I usually either have a couple of cheapy 2 for £1 frozen pizza baguettes (I know, it’s disgusting, but I do actually like them) or I pig out on chocolate and crisps. As you can see, neither of these post-gym meals are exactly healthy. So, yesterday, I decided to be prepared and make something in the afternoon I could heat up quickly when I got back. 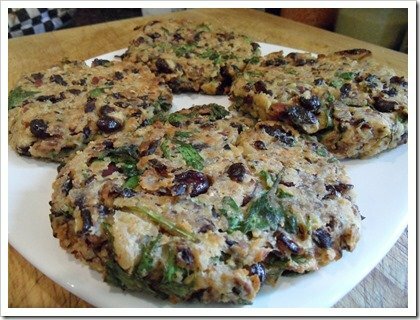 I’d planned to make these easy bean burgers from Veggie Burgers Every Which Way this week anyway, so yesterday seemed as good a time as any. Especially as, in the book, it says any leftover cooked burgers can be reheated in the oven in about 15 minutes. Perfect. After I’d made them, I obviously needed to test one and it was delicious hot. It was also delicious cold when I got back from the gym. Yes, cold. I couldn’t be bothered to heat it up so I had it with some celery sticks, tomatoes, olives and hummous while I watched Sharon in Eastenders beep away in intensive care. Preheat oven to 190C/375F/gas 5. In a mixing bowl, mash the beans using a potato masher or fork. Fold in the eggs, parsley, vegetarian Parmesan, mustard, salt, pepper and lemon juice. Fold in the breadcrumbs, adding more if the mixture is too loose. Let sit for 5 to 10 minutes for the crumbs to soak up some moisture. Adjust seasonings. Shape into 4 patties. In an ovenproof frying pan or nonstick sauté pan, heat the oil over medium-high heat. When hot, add the patties and cook until browned on each side, 6 to 10 minutes total. Transfer the pan to the oven and bake for 12 to 15 minutes, until the burgers are firm and cooked through. I seem to have become a bit of a Linda McCartney fan-girl recently and now I’ve tried the Linda McCartney Vegetarian Burgers with a Peppered Mushroom Melt, I reckon they’ll be popped into the shopping basket each week along with the Fish Free Scampi. The Meat Eater wanted his burger in a bun with all the trimmings, while I was fine having it on its own, but I’m glad he persuaded me otherwise, as this burger was absolutely delicious. I crammed the bun full of lettuce, red pepper, tomato, gherkin, cheese, Nando’s Peri Peri Sauce and mayonnaise, but this didn’t stop the flavour of the burger coming through, nor the mushroom sauce the burger’s topped with. My burgers were found next to the Fish Free Scampi in the chilled cabinet at Tesco and cost £2.69. It was 1992 when I first became vegetarian. In the beginning, I shied away from the ‘meaty’ vegetarian burgers as I was one of those people who thought ‘if you’re vegetarian, why eat something that’s pretending to be meat?’ So, before I learnt to cook, I bought vegetable burgers that consisted of some kind of unidentifiable soggy vegetable encased in soggy breadcrumbs. Because of this, I’ve spent 20 years avoiding vegetable burgers and have been embracing the more ‘meaty’ types of burgers (I’m no longer one of those annoying ‘why eat something…’ type of people). But since Dalepak sent me a hamper of their vegetarian range which is all about the vegetable, I’m a convert. The latest product I’ve tried is their Spicy Bean Quarter Pounders. They declare on the packet ‘big size big taste’ and I can confirm that these beauties are big. They also pack in a hefty 272 calories per burger, so you only need one of these. 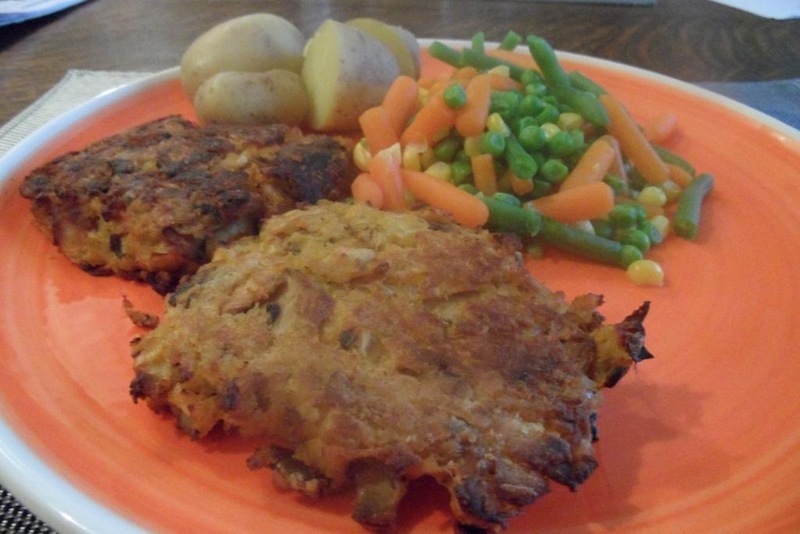 The golden brown breadcrumbs were crispy and the texture was firm and not at all gungy. The only slight complaint I have is that the burger crumbled slightly when I cut into it and didn’t want to stay on the fork. Dalepak aren’t lying about the ‘spicy’ bit – there’s a definite warmth to them that’s not too spicy for the lightweights out there but spicy enough for those of us who like a bit of heat to their food. 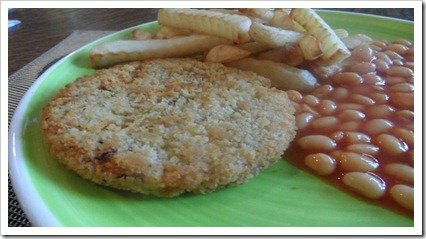 I am impressed with these bean burgers and what I’ve found even more impressive is that they’re only £1 for a pack of four. They’re exclusive to Iceland but if that’s not somewhere you shop often (I’m not sure I’ve ever been in an Iceland store), if you’re going past one, they’re definitely worth popping in for. 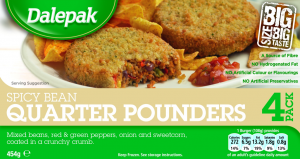 Dalepak Spicy Bean Quarter Pounders are Vegetarian Society Approved and also suitable for vegans. I should have learnt my lesson last week when making burgers that they’re a bit of a faff. These took almost two hours to make (although the recipe says one hour – I’m a slow cook) and I really did think I’d spent two hours making something that was going to turn out to be a disaster. The lentils and bulgur wheat didn’t absorb their water and although I could just about drain the bulgur wheat, the lentils were soggy and I thought there’s no way these burgers are going to firm up. Bring the lentils and at least 475ml water to a boil in a small saucepan. Cover, reduce the heat and simmer for 20-25 minutes, until the lentils are cooked and beginning to fall apart. Transfer to a baking sheet or mixing bowl to cool. Meanwhile, bring 150ml water to a boil. Stir in the bulgur wheat with a pinch of salt, cover and remove from the heat. 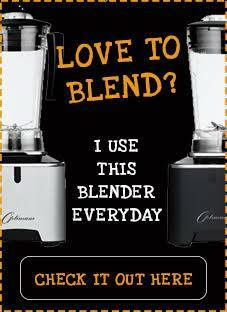 Let stand for about 7 minutes, until all the liquid is absorbed. Preheat the oven to 190C/gas 5. Heat 1 tablespoon of the oil in a sauté pan over medium heat. Add the mushrooms and cook until they release their moisture and it evaporates, 8 to 10 minutes. Transfer to a large mixing bowl and wipe out the sauté pan. Heat 1 tablespoon of the remaining oil in the sauté pan over medium heat. Add the leeks and thyme and cook, stirring frequently, until the leeks are completely softened and beginning to caramelise, 15-20 minutes. Stir in the garlic and tomato purée and cook for 2 minutes longer. Transfer to the bowl with the mushrooms and stir to mix. Combine half of the lentils, half of the bulgur wheat and half of the leek mixture with the cashews, eggs, salt and pepper in a food processor. Pulse until uniformly pureed but still slightly chunky. Add the puréed mixture and the remaining lentils and bulgur wheat to the remaining leek mixture in the bowl. Work in the breadcrumbs. Shape the mixture into 8 patties. In a large ovenproof frying pan or non-stick sauté pan, heat the remaining 2 tablespoons oil over medium-high heat. When hot, add the patties and cook until browned on each side, 6-10 minutes total. Transfer the pan to the oven and bake for 12-15 minutes, until the burgers are firm and cooked through.